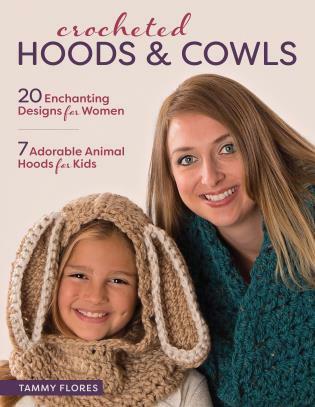 This collection of crocheted patterns includes adorable animal hoods like a giraffe and bunny for kids and elegant, textured styles for adults. Hoods are both stylish and extra-warm, protecting both your head and neck from the winter chill. Various stitch patterns and embellishments make these hoods interesting and fun to crochet. Tammy Flores is a former yarn shop owner and the current owner and design force behind Posh Patterns, her independent crochet and knit pattern line. She resides in Mequon, Wisconsin.